For many of us, our earliest childhood memories are related to the things that we loved to do the most. Whether that be a trip to Disneyland, playing baseball with our Dad, fishing, or a special trip with our families. Often, it is those same things that we love to do today. For our family that was collecting fossils. It was like a giant puzzle of the history of the earth. Constantly urging us to understand a little more. Back in the mid 1960's, our family moved to Brigham City UT. My Grandfather, Lloyd Gunther, sought out advice from a paleontologist, Dr. Stewart Williams, and was directed towards the mountains to the north of town. It had been studied by some of the greatest minds of early paleontological research in the western United States. My Grandfather was cautioned though, that it had been collected out, and that there is not much left to find. That did not discourage my Father and Grandfather from trying though, and we earnestly sought out fossil bearing rocks that they could see from the backyard of our home. It wasn't long before we discovered the fossil bearing rocks and learned that with a little, or a lot of work, we could collect the vast exposures and find fossils. Not being familiar with everything that we might find, in our wisdom, we contacted Dr. Richard Robison. As a result we began to learn more and more about what we were finding. Identifying the various fossils became an exciting adventure, even to the extent that we began to understand where different types of fossils came from in the formation. With time, we found things that were not recognized by Dr. Robison. New species were found and the desire to search out these, and more, became an even greater attraction. Dr. Robison helped connect us with some of the foremost experts in the various fields of paleontology that would be able to further our understanding. Some might think that we would covet these new species and not want to give them away to be studied, however the opposite was true. There was never a thought of hording these for ourselves. Anything that might be of interest to science was freely given to those that were interested. Some of the finest specimens we had were happily given away. 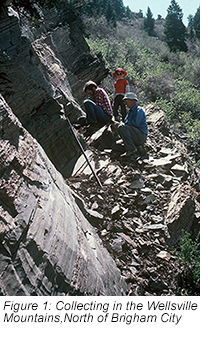 By 1980, our family name was somewhat synonymous with fossil collecting in Utah. By that time we had done so much to advance the knowledge of paleontology in Utah that we were nominated and awarded the very first Strimple Award, given by the Paleontological Society to recognize outstanding achievement in paleontology by amateurs. There were few weekends when one of us wasn't anxiously engaged in furthering the science of paleontology, whether digging along with a University project, or out exploring, trying to find new exposures and new fossils somewhere in the Western United States. Between the years of about 1970 and 2015, this desire to collect and contribute permeated everything that our family did in relation to fossils. We continued to collect and donate specimens as readily as we could find them. Leading professional academic paleontologists from all over the world to some of our best collecting sites and sending them away with anything that they wanted and more. During that time, well over 10,000 specimens and dozens of scientific papers were written referencing contributions that were made. Two books were coauthored by the Gunthers, specifically about fossils from the middle Cambrian of Utah. Grandpa Lloyd passed away at the age of 95, largely because he could no longer get out in the field and collect. His desire to stay alive was directly related to his ability to get out and break rocks. When that became an impossibility, it wasn't long before he was gone. It kept his body and mind young. One might ask, while this is all nice and good, what does this have to do with anything that I should care about today… On March 30th of 2009, President Barak Obama signed the Ominbus Public Land Management Act. Buried within this new law was Subsection D, called the Paleontological Resource Preservation Act, or PRPA for future reference. This act was largely the objective of Federal land agencies and vertebrate paleontologists to ensure that the rules that they had been held to for years were also projected across the aisle to all 'fossil resources'. It also strengthen laws regarding the selling of fossil resources to ensure that the criminal aspects of collecting and selling fossils are consistent across agencies. If you have not already, I encourage each of you to look up this act and study it. Without an understanding of it you might find yourself at odds with an army of Federal agents one of these days. For thoroughness, I thought it wise, to include some of the details that are most pertinent to the avocational collector. For a commercial, or professional academic paleontologist, I pity you if you ever touch a fossil without a permit on public lands. CASUAL COLLECTING- The term `casual collecting' means the collecting of a reasonable amount of common invertebrate and plant paleontological resources for non-commercial personal use, either by surface collection or the use of non-powered hand tools resulting in only negligible disturbance to the Earth's surface and other resources. As used in this paragraph, the terms `reasonable amount', `common invertebrate and plant paleontological resources' and `negligible disturbance' shall be determined by the Secretary. As indicated in the text above, it would seem that a 'casual collector' shouldn't have much to worry about, as long as he or she was only collecting 'common invertebrate and plant' fossils. However, the next sentence is where things get complicated. By law, the secretary must determine what a reasonable amount, what is common, what is negligible. More on this later. In General- The Secretary shall manage and protect paleontological resources on Federal land using scientific principles and expertise. The Secretary shall develop appropriate plans for inventory, monitoring, and the scientific and educational use of paleontological resources, in accordance with applicable agency laws, regulations, and policies. These plans shall emphasize interagency coordination and collaborative efforts where possible with non-Federal partners, the scientific community, and the general public. Coordination- To the extent possible, the Secretary of the Interior and the Secretary of Agriculture shall coordinate in the implementation of this subtitle. There are two points here worth considering. First the protection plan for fossil resources shall emphasize coordination amongst agencies, non-Federal partners, scientists and the general public. Second, to the extent possible the agencies that write the rules and enforce them shall coordinate. 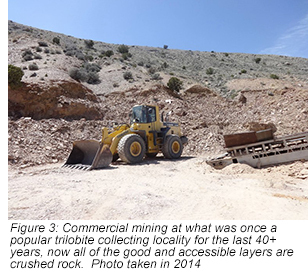 IN GENERAL- Except as provided in this subtitle, a paleontological resource may not be collected from Federal land without a permit issued under this subtitle by the Secretary. CASUAL COLLECTING EXCEPTION- The Secretary shall allow casual collecting without a permit on Federal land controlled or administered by the Bureau of Land Management, the Bureau of Reclamation, and the Forest Service, where such collection is consistent with the laws governing the management of those Federal land and this subtitle. If you want to collect any fossils on any Federal land, you must have a permit. That is unless you are a 'casual collector'. Except, what is a casual collector? If you are not a casual collector you can't touch a fossil from Federal land in any way. If you are a 'casual collector', you can touch and exchange, but not sell, common invertebrate and plant fossils. But then again, what is a 'casual collector', and who decides what is common? If a federal agent decides that you are not a 'casual collector', even if you think you are, or that you collected something this does not meet their description of 'common', you might get turned in for a reward. This is tough because a lot of us trade fossils with friends. It is how we learn about new specimens and localities. It is part of our culture as fossil collectors. From now on, no fossils localities will be included in scientific publications, unless the agency wants to disclose the site. So much for including the public. This is worrisome as now science is required to hide from the public. Although it may be illegal to touch a fossil, except in rare cases it seems. It is perfectly acceptable to dig them up and turn them into crushed rock, or any other acceptable form of industrial use. It is also not acceptable to impose any restrictions, because of fossil resources, on any other permitted use of Federal lands. In other words, it is perfectly fine to destroy fossils, but you can't collect them. So what does all of this really mean? For the commercial fossil seller, this strengthens the laws against doing anything with fossils that are found on Federal lands, regardless of the type. Whether it be a dinosaur tooth, or the weathered shell of a common brachiopod. If there was any grey area before, there is none left now. If you have never collected a fossil in your life, you have little to be concerned about as long as you are not knowingly collecting vertebrate fossils. The biggest issue, and the one that I have highlighted already, concerns amateur paleontologists. I would have typically called these people 'casual collectors'. It is not their job, it is just something that they love to once a month or on weekends. The agencies were charged with the determination of reasonable amount, common invertebrate and plant fossils and negligible disturbance. When this law came out those were the three things that kept me up at night. What I didn't expect was for an agency to go beyond the requirements of the law and define 'casual collecting'. Fast forward to 2013. The Forest Service was the first agency to write their rules to implement the PRPA. In late May of 2013, the Forest Service issued their draft rules for comment. The comment period lasted for 60 days. I won't go into the details of this draft, but suffice it to say that they were so restrictive that no amateur collector could ever 'practically' collect fossils again on Forest Service land. Although not covered in this discussion, the academic community that at one time had free reign to explore public lands now would have no such freedom again. A permit would now be required for them to be able to do anything. In addition, they would be unable to rely on the so called amateur or 'casual collectors' that had done so much to support their efforts. At the end of the 60 day comment period only 177 persons had responded to their draft rules. On April 17th, 2015 the Forest Service published their final rule in the Federal register. https://www.federalregister.gov/articles/2015/04/17/2015-08483/paleontological-resources-preservation Most particularly, as it relates to the casual or amateur collector, they were required by the law (PRPA) to define each of the things outlined previously; reasonable amount, common invertebrate and plant fossils and negligible disturbance. Reasonable amount means a maximum per calendar year of one-hundred pounds by weight, not to exceed twenty-five pounds per day. Common invertebrate and plant paleontological resources are invertebrate or plant fossils that are of ordinary occurrence and wide-spread distribution. Not all invertebrate and plant paleontological resources are common. Negligible disturbance means little or no change to the surface of the land and causing minimal or no effect on other resources. The Authorized Officer has discretion to determine what constitutes negligible disturbance. Although I disagree with their definitions, and in particular the amounts and ambiguity of them, this was required. What concerns me the most, is what was done beyond that required by the law. They also decided to define additional pieces of the law that turned their rule into a death sentence for the casual and amateur collectors. Non-powered hand tools mean small tools that do not use or are not operated by a motor, engine, or other power source. These tools are limited to small tools that can be easily carried by hand such as geologic hammers, trowels, or sieves, but not large tools such as full-sized shovels or pick axes. As far as the Forest Service is concerned a hand tool is a tool that can only be used with one hand apparently. Do not get caught with a shovel, pick or bar in your hand if you are on Forest Service lands. This, in conjunction with the limit of 25 lbs. a day and 100 lbs. a year, means that as a casual or amateur collector, you are now limited to being able to collect a few days a year, with a generally inadequate set of tools. I would ask any of you that are amateur collectors, do you think that this is a reasonable set of constraints? To make matters even worse, the Forest Service went even farther and took upon themselves the prerogative to define the meaning of the word casual in the section by section explanation of the rule. The term casual collecting… The Department considers that in establishing the term "casual collection" rather than "amateur collection" or "hobby collection" or "recreational collection", the Act intended that casual collection reflect the commonplace meaning of "casual". The commonplace definition of casual includes the elements "happening by chance; not planned or expected", "done without much thought, effort, or concern", and "occurring without regularity" … Consequently, the Department considers that casual collecting would generally be happenstance without intentional planning or preparation… Consequently, it is clear that the lack of Department decision space concerning such casual collection performed by an individual reflects that the Act intended that reasonable amount and negligible disturbance criteria established for casual collecting would be below levels that would otherwise require an evaluation under the National Environmental Policy Act (NEPA). Collection of amounts and/or land disturbance at levels that would require a NEPA evaluation would require a permit. In going so far as to define 'casual collecting' as occurring by happenstance, and without intent, the Forest Service has effectively turned every hobby or amateur collector into a criminal. It seems contrary to even suggest that a person be able to carry any tools at all considering the definition of casual as having intent. Let me say that when I read this all hope of ever being able to collect fossils again on public lands was lost. Because I have a genuine and sincere interest in fossils I am no longer ever allowed to pick up a fossil bearing rock again on Forest Service lands. It would be fair to suggest that anyone reading this article has suffered the same fate as I have. The closing few sentences in their explanation offers an interesting insight into their rational. It seems that in their train of thought, using a shovel on public lands might in some way constitute a requirement for NEPA evaluation. It must be asked, has it really come to this, that a citizen of this country can no longer dig a hole on public lands for fear that it could trigger a requirement for an environmental impact statement? Some might suggest that because this is just the Forest Service rule it does not affect them; that perhaps the BLM will take a different approach to defining the requirements (If I only shared such optimism). By law, the agencies are required to coordinate and implement the PRPA. From a somewhat pessimistic perspective, considering that I am no longer allowed to pick up a fossil on Forest Service land, I find it hard to envision that the BLM will somehow take a drastically different approach to the implementation of the PRPA on BLM lands. For reference, the BLM has yet to publish their draft rules for comment. Living in the west I had always felt that as a citizen of this country I had a great advantage over my fossil collecting friends in the east. I have always been free to drive and hike into the deserts and mountains around me to explore, collect and enjoy the thrills of discovering fossils. That freedom has been taken from me. Because there is so much Federal (public) land in the west, very few fossils can be found anywhere else. Today, I am jealous of my friends in the east who can with permission collect fossils to their hearts content on private lands. I fear that this will not stop here. There are some paleontologists out there that believe they are the only people in this world that should be entitled to possess or study fossils. It is no longer a distant concern that someday this agenda will be applied to all fossils, regardless of type or land ownership on which they reside. The government could declare that all fossils are held in trust by them and no person shall be able to collect or own a fossil again without their permission. The section of the Ominbus Public Land Management Act pertaining to paleontology was a mere 2,500 words in length, only a small portion of which applied to non-professional collection of fossils. However, this act has destroyed amateur paleontology on public lands. The days of amateur contributions to science are gone. Modern bureaucrats have ignored decades upon decades of contributions by amateur collectors to the science of paleontology. There are countless collections that have been donated to museums all over the world that were the life work of dedicated amateurs, who collected fossils because of their love for learning and interest in the life that was on this earth long before ours. It is a great disservice to those that have gone before us and a tragedy for future generations that will be unable to participate in this great cause of furthering our understanding of past life on this earth. We recently participated in the publishing of a book on the Cambrian fossils of Utah. 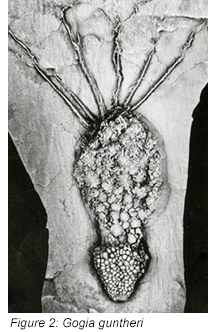 "Exceptional Cambrian Fossils Of Utah: A Window Into The Age Of Trilobites". In a sense this has been the culmination of a lifetime of work. Both by us, and by many others who had gone before us and have come along on our journey with us. Without the contributions of our family and so many other amateur collectors, this book would not exist. Dozens upon dozens of new species that have been discovered and described would never have been found. The long standing collaboration of professional paleontologists and amateur collectors is now dead. Without the ability to collect, to dig, to use tools, to find many thousands of common fossils in order to discover that one new species, science will suffer. I can now say again, as we were told nearly 50 years ago, 'there is not much left to find'.